The Tacoma City Council passed the Bring Your Own Bag (BYOB) ordinance in July 2016. The law regulates the use of checkout bags and went into effect on July 12, 2017. PSA translations available in Khmer, Korean, Russian, Spanish and Vietnamese. To view in another language, visit the City’s YouTube channel and click the Settings menu. Check out the ECO Playlist to watch the latest Bring Your Own Bag videos. 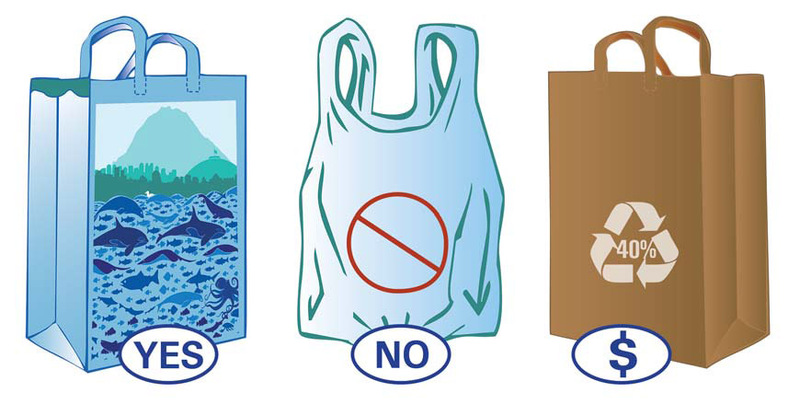 Thin plastic checkout bags may no longer be distributed at any Tacoma retail establishments. Retail establishments must collect a minimum pass-through charge of five cents for each recycled paper or reusable checkout bag requested by customers. Those with EBT/WIC/TANF benefits do not have to pay the pass-through charge on paper bags. Bags other than checkout bags, such as produce bags, dry cleaning bags and newspaper bags, continue to be available for free. The law follows the same checkout bag restriction model that 12 other communities in Washington State have implemented. During the one year implementation period City staff distributed free reusable bags, conducted focused engagement in low-income communities, and provided educational resources to businesses. To learn more and get resources, visit the shopper information and business information web pages. Sign up for "BYOB Implementation Updates"